The project is facilitating the establishment of gravity-flow water supply system in Adivasi Colony village, an un-electrified village in Ganjam district, Orissa state. The project is supporting Adivasi Colony village who have already built sanitation infrastructure, to access safe piped water supply and thus, assisting them to complete their water and sanitation intervention. Adivasi Colony village is a small tribal village, having 19 households, out of which 53% are living bellow the poverty line (BPL). With Gram Vikas' assistance, the village have started building the sanitation infrastructure in April 2008 and all 19 families have completed the construction of their toilets and bathing rooms. The toilets and bathrooms were built at least 3m away from house. In order to avoid flooding of latrine pits during rainy season, the tops of the platform and the pits are 0.45-0.6m above ground level. Villagers were also encouraged to grow banana, papaya and coconout trees around toilet soak pits to leach excess water, so that the pit can be used for at least five years before it becomes full and waste must be diverted to the second pit. By the time the second pit is full, the contents of the first have been composting for at least five years and the pathogens have been killed. This compost can then be used as organic maneau. 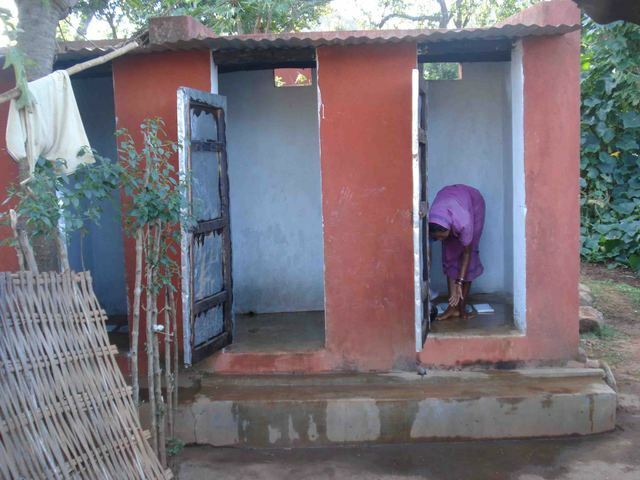 The design and layout of toilets-bathing rooms were done in consultation with the villagers. The whole sanitation infrastructure was built with full community participation and each family was involved in the whole process and thus, ensuring 100% inclusion at all times. Gram Vikas had also provided technical support and training during the course of construction. The hard & strategic work of the villagers facilitated in completion of pipe line digging work at Adivasi colony. Now each household is connected with piped water supply. The joy of tapping water at the door step is phenomenal to them. The sanitary blocks are in use after water connectivity. Women in particular heave a sense of relief as in the coming rainy season they will not get wet while collecting water or relieving open. The dignity is ensured & hard work recognized. After completion of TBRs work villagers identified the water source. They have no understanding about the technical aspects of Gravity Flow but they facilitated in trapping out perrenial source based on their know how of the forest resources. The laying of pipe lines from the identified source of the hills to the village was not easy for them in the scorching heat & humidity. Members from each household started their day early in the morning. After having some watered rice they walked in to the forest along with digging instruments, cooking materials. They prepared their meal in the forest in order to save time. Women were the key players & unbothered of the surmounting pressure of domestic & community work. During all the process they faced unusual setbacks like thunder storm, fear of wild animals. Notable thing is that instead of attending paid labor they donated the labor for greater benefit of the community. They are illiterate, struggle hard to meet the day's need but they understand these toil is going to assure them a dignified life, relieve from drudgery & pave their time in constructive work in coming days. The laying of pipeline is over & water supply to each household is to be completed by the end of the current month. Once it is achieved villagers' effort is going to be classified in the vicinity. They feel proud when neighboring villagers appreciate their tireless effort. Their involvement is making them closer to the goal each passing day. the tribal aspire to have dignified life & facilitation of institutional guidance like Gram Vikas to narrow down the gaps from main stream development. Total families: 19 out of which 10 living below poverty line (BPL) and 9 above poverty line (APL). All families are scheduled tribe. The total population is 72 out of which 49 adults (39 male and 33 female) and 23 children (15 boys and 8 girls). A total number of 23 children are living in the village out of which 15 boys and 8 girls.